We’re talking the book presentation of 100 Secrets of the Art World by Thomas Girst and Magnus Resch. FYI: Girst also wrote about the management of art galleries in a book with a glossy pink cover. Just saying that sometimes the package says it all. 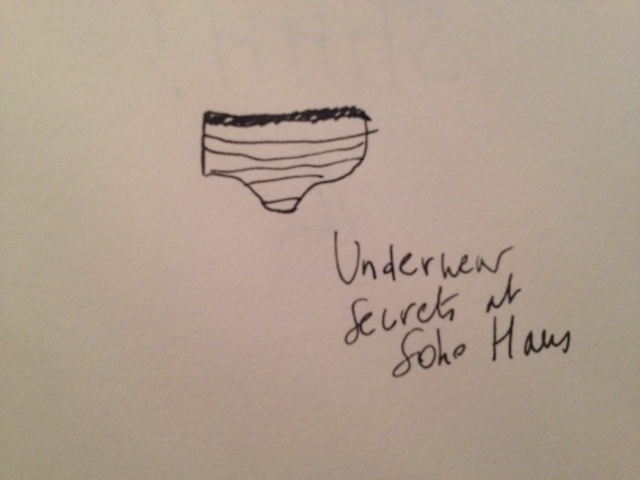 Soho-House seems to be a perfect location for secrets of the art world. Don’t we all wanna become a member just to meet the art world intimately in its underwear at the Soho gym lockers? Oh yeah, we do. I don’t know if all the art celebrities of the book were present but I know for sure that Berlin Bienniale-boss Gabriele Horn was and she even went on stage to say something, which, according to my informant, she shouldn’t have done. You see, Girst and Resch were cracking jokes on stage as if they were hosting a Hollywood gala. It wasn't the right setting for Horn's credibility. Girst and Resch were boasting about their big success in New York. Yet in Berlin, by the end of the evening they sold only one third out of a total of 100 books. The salespersons didn’t know if they had to be sad because of the bad sales or happy because Berlin turns out to be a lot smarter than New York. You see, 100 Secrets of the Art World doesn’t reveal any personal art secrets. One would think people start with themselves, but then they don’t. They also don’t tell somebody else’s secret. Nobody talks out of school these days. The book doesn’t even make it to the open secrets of the art world. I can understand your confusion - what’s left? Nothing. I mean, Nicolas Berggruen, presented in the book as a billionaire collector, philantropist and investor, recommends to “experience and buy art with your eyes.” You can only hit your head and say “duh” to that one. There are of course always a few souls who try very very hard to be “honest” and come up with something “real”. As expected Isabelle Graw, director of Texte zur Kunst, did so, revealing that because of social media no secrets seems to be left in the art world, except for the hidden fears behind those happy faces - the fear of not succeeding, of losing social position. Oh, Isabelle, just stop trying!